Electronic Arts chief executive John Riccitiello has indirectly confirmed that the Dead Space series will get another sequel, saying he doesn't think it will become one of the publisher's big-money franchises until Dead Space 3 is released. Dead Space was cool but wasn't a huge seller, putting up around two million units sold in roughly two years of release, a respectable number but hardly gangbusters for a triple-A title from a major publisher. 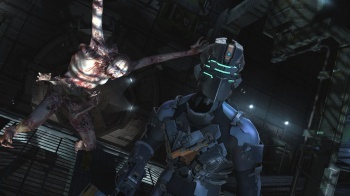 Dead Space 2 is doing considerably better, approaching unit sales of two million after just one week on the shelves. But Riccitiello told an audience at the Goldman Sachs Technology and Internet Conference that he doesn't think the Dead Space series will really hit the big time until the third game is out. "Right now we've got strong, growing franchises including Madden, FIFA... Need for Speed, Medal of Honor and Battlefield - I include them as one because we're unlikely to ship them in any one year at the same time," he said. "[There's also] Mass Effect... Dragon Age... and the one that's sort of not proven that's coming later in our fiscal year, Star Wars [The Old Republic]." "That excludes Dead Space because I think it will probably take Dead Space 3 before we get into that five million unit cadence versus say three, four," he added. It's not exactly carved in stone but the implication is obvious: Dead Space 3 is coming. Of even greater note, however, is Riccitiello's apparent willingness to show patience with franchises that may not be a huge success out of the gate but show big potential for the future. That's an approach to making games that I think I could learn to like.